The magnificent frigatebird (Fregata magnificens) is a seabird of the frigatebird family Fregatidae. With a length of 89–114 centimetres (35–45 in) and wingspan of 2.17–2.44 m (7.1–8.0 ft) it is the largest species of frigatebird. It occurs over tropical and subtropical waters off America, between northern Mexico and Ecuador on the Pacific coast and between Florida and southern Brazil along the Atlantic coast. There are also populations on the Galápagos Islands in the Pacific and the Cape Verde islands in the Atlantic. The magnificent frigatebird is a large, lightly built seabird with brownish-black plumage, long narrow wings and a deeply forked tail. The male has a striking red gular sac which it inflates to attract a mate. The female is slightly larger than the male and has a white breast and belly. Frigatebirds feed on fish taken in flight from the ocean's surface (often flying fish), and sometimes indulge in kleptoparasitism, harassing other birds to force them to regurgitate their food. They saw a bird that is called a frigatebird, which makes the boobies throw up what they eat in order to eat it herself, and she does not sustain herself on anything else. It is a seabird, but does not alight on the sea nor depart from land 20 leagues. There are many of these on the islands of Cape Verde. In the 15th century text the name of the bird is written as rabiforçado. The modern Spanish word for a frigatebird is rabihorcado or "forked tail". A population of magnificent frigatebirds once bred on the Cape Verde Islands but is now probably extinct. The Man-of-War (as it is called by the English) is about the bigness of a Kite, and in shape like it, but black; and the neck is red. It lives on Fish yet never lights on the water, but soars aloft like a Kite, and when it sees its prey, it flys down head foremost to the Waters edge, very swiftly takes its prey out of the Sea with his Bill, and immediately mounts again as swiftly; never touching the Water with his Bill. His Wings are very long; his feet are like other Land-fowl, and he builds on Trees, where he finds any; but where they are wanting on the ground. The modern name Frigate Bird was used in 1738 by the English naturalist and illustrator Eleazar Albin in his A Natural History of the Birds. The book included an illustration of the male bird showing the red gular pouch. Like the genus name, the English term is derived from the French mariners' name for the bird la frégate—a frigate or fast warship. The magnificent frigatebird was originally considered to belong to the species Fregata aquila but in 1914 the Australian ornithologist Gregory Mathews proposed that the magnificent frigatebird should be considered as a separate species with the binomial name Fregata magnificens. Of the four other species within the genus Fregata, genetic analysis has shown that the magnificent frigatebird is most closely related to the Ascension frigatebird (Fregata aquila). The magnificent frigatebird is widespread in the tropical Atlantic, breeding colonially in trees in Florida, the Caribbean and also along the Pacific coast of the Americas from Mexico to Ecuador, including the Galápagos Islands. The magnificent frigatebird is the largest species of frigatebird. It measures 89–114 cm (35–45 in) in length, has a wingspan of 2.17–2.44 m (7.1–8.0 ft) and weighs 1.1–1.59 kilograms (2.4–3.5 lb). 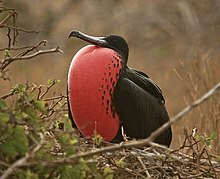 Males are all-black with a scarlet throat pouch that is inflated like a balloon in the breeding season. Although the feathers are black, the scapular feathers produce a purple iridescence when they reflect sunlight, in contrast to the male great frigatebird's green sheen. Females are black, but have a white breast and lower neck sides, a brown band on the wings, and a blue eye-ring that is diagnostic of the female of the species. Immature birds have a white head and underparts. It spends days and nights on the wing, with an average ground speed of 10 km/h (6.2 mph), covering up to 223 km (139 mi) before landing. They alternately climb in thermals, to altitudes occasionally as high as 2,500 m (8,200 ft), and descend to near the sea surface. The only other bird known to spend days and nights on the wing is the common swift. This bird makes a shallow platform nest on top of both trees and bushes on islands and cays with mangroves. This nest is constructed out of branches and twigs. The magnificent frigatebird lays a clutch of one clear white egg that measures 68 by 47 millimetres (2.7 by 1.9 in) on average. This egg is incubated by both sexes for a period of 50 to 60 days. After the egg hatches, the male parent will abandon it, with the female staying to provision for the young for almost a year. This species feeds mainly on fish, squid, jellyfish, and crustaceans. Individual bird diets vary depending on food availability and preferred hunting technique. It is a kleptoparasite, pecking at other seabirds to force them to disgorge their meals. After forcing the other seabird to regurgitate its meal, the magnificent frigatebird will dive and catch the prey before it hits the surface of the water. A scientific study which examined genetic and morphological variation in magnificent frigatebirds found both expected and also highly unexpected results. As predicted by the flight capacity of the species, the authors found signatures of high gene flow across most of the distribution range. This included evidence of recent gene flow among Pacific and Atlantic localities, likely across the Isthmus of Panama. This geological formation is a strong barrier to movement in most tropical seabirds. However, the same study also found that the magnificent frigatebird on the Galápagos Islands is genetically and morphologically distinct. Based on this study, the Galápagos population has not been exchanging any genes with their mainland counterparts for several hundred thousand years. Given these findings, the Galapagos population of this tropical seabird may be a genetically distinct species warranting a separate conservation status. This small population of genetically unique magnificent frigatebirds is vulnerable. Any catastrophic event or threats by humans could wipe out the population of approximate two-thousand magnificent frigatebirds that nest on the Galápagos Islands. Magnificent frigatebirds are currently classified as of Least Concern by the International Union for Conservation of Nature, but because of the genetic uniqueness of those on the Galápagos Islands this may need to be revisited. ^ Du Tertre wrote: "Loyseau que les habitans des Indes appellent Fregate (à cause de la vistesse de son vol) n'a pas le corp plus gros qu'une poule ...". ^ BirdLife International (2012). "Fregata magnificens". IUCN Red List of Threatened Species. Version 2013.2. International Union for Conservation of Nature. Retrieved 26 November 2013. ^ a b Hartog, JC den (1993). "An early note on the occurrence of the Magnificent Frigate Bird, Fregata magnificens Mathews, 1914, in the Cape Verde Islands: Columbus as an ornithologist". Zoologische Mededelingen. 67: 361–364. ^ a b Dunn, Oliver; Kelley, James E Jr (1989). The Diario of Christopher Columbus's First Voyage to America, 1492-1493. Norman, Okla USA: University of Oklahoma Press. p. 45. ISBN 0-8061-2384-2. ^ Suárez, Pedro López; Hazevoet, Cornelis J; Palma, Luís (2013). "Has the magnificent frigatebird Fregata magnificens in the Cape Verde Islands reached the end of the road?" (PDF). Zoologia Caboverdiana. 3 (2): 82–86. ^ a b Jobling, James A (2010). The Helm Dictionary of Scientific Bird Names. London: Christopher Helm. pp. 164, 237. ISBN 978-1-4081-2501-4. ^ a b Jean-Baptiste, du Tertre (1667). Histoire générale des Antilles habitées par les François (in French). Volume 2. Paris: Thomas Joly. p. 269, Plate p. 246. ^ a b Dampier, James (1699) . An Account of a New Voyage Around the World. London: James Knapton. p. 49. ^ Albin, Eleazar (1738). A Natural History of the Birds. Volume 3. p. 75 and plate 80 on previous page. ^ Jobling, James A. (2010). The Helm Dictionary of Scientific Bird Names. London, United Kingdom: Christopher Helm. p. 164. ISBN 978-1-4081-2501-4. ^ Mathews, GM (1914). "On the species and subspecies of the genus Fregata". Australian Avian Record. 2 (6): 120 (117–121). ^ Weimerskirch, Henri; Chastel, Olivier; Barbraud, Christophe; Tostain, Olivier (2003). "Frigatebirds ride high on thermals" (PDF). Nature. 421 (6921): 333–334. doi:10.1038/421333a. PMID 12540890. ^ a b c Hauber, Mark E. (1 August 2014). The Book of Eggs: A Life-Size Guide to the Eggs of Six Hundred of the World's Bird Species. Chicago: University of Chicago Press. p. 127. ISBN 978-0-226-05781-1. ^ "Fregata magnificens (magnificent frigatebird)". Animal Diversity Web. Retrieved 11 April 2018. ^ a b Hailer, Frank; Schreiber, EA; Miller, Joshua M; Levin, Iris I; Parker, Patricia G; Fleischer, Robert C (2011). "Long-term isolation of a highly mobile seabird on the Galapagos". Proceedings of the Royal Society B. 278 (707): 817–825. doi:10.1098/rspb.2010.1342. PMC 3049043. PMID 20861041. Diamond, AW (1973). "Notes on the breeding biology and behavior of the Magnificent frigatebird" (PDF). Condor. 75 (2): 200–209. doi:10.2307/1365868. JSTOR 1365868. González, Monica; de la Cueva, Horacio (2007). "Apparent survival of adult Magnificent Frigatebirds in the breeding colony of Isla Isabel, Mexico". Waterbirds. 30 (1): 73–79. doi:10.1675/1524-4695(2007)030[0073:ASOAMF]2.0.CO;2. González-Jaramillo, Monica; Schloegl, Christian; de la Cueva, Horacio (2012). "Adoption as a conservation strategy for the Magnificent Frigatebird (Fregata magnificens)". Southwestern Naturalist. 57 (3): 332–335. doi:10.1894/0038-4909-57.3.335. Osorno, José Luis; Székely, Tamás (2004). "Sexual conflict and parental care in magnificent frigatebirds: full compensation by deserted females". Animal Behaviour. 68 (2): 337–342. doi:10.1016/j.anbehav.2003.06.027. "Magnificent frigatebird media". Internet Bird Collection. This page was last edited on 2 March 2019, at 14:07 (UTC).